Five very different teenagers are drawn together by a traumatic experience with a suspicious cause. They aren’t sure who messaged them all to the meeting where the all could have died. But one of their parents had the means of bringing the building down. As crazy as it sounds, the teens start with a theory; and pieces begin falling into place as they investigate. And Then There Were Four is a fast-paced thrilling whodunit. The character development was exceptional – especially for the narrators. The narrative itself is a bit strange – with one speaking in first person past tense and another in second person present tense – every other chapter. I’m not sure why that distracting choice was made other than to make the two voices more distinct. Thankfully, I was able to get used to it and enjoy the story that proved to be heart-pounding suspense with several fun twists along the way. Courtesy of G.P. Putnam’s Sons, I have a copy of Extreme Prey by John Sandford for one (1) lucky winner! Contest is open to US residents only. No PO Boxes please. To enter, just fill out the form below. Contest ends May 13. I’ll draw a name on May 14, and notify winner via email. Courtesy of Putnam, I have a copy of Gathering Prey by John Sandford for one (1) lucky winner! Contest is open to US residents only. No PO Boxes please. To enter, just fill out the form below. Contest ends May 14. I’ll draw a name on May 15, and notify winner via email. Jack is hired to find a recent parolee that he sent to prison years before. A talented sniper and only one of a handful that could have made the shot that hit the president of France. This time he travels to Europe and has to work outside the local law in order to uncover the truth and find those responsible. This is only the second Jack Reacher novel I have read. But even just reading one novel, I feel like I know the character. Lee Child is incredibly talented at writing vivid characters, a strong mystery, and action-packed scenes. And Personal is no exception. Full of intrigue, suspense, violence, and drama – this thriller is fast-paced excitement from beginning to end. It will take all of his skills (as well as those of the team he burned) and all of his cunning, if Monarch is to thwart the violent and deadly goals of the very powerful cabal who will do whatever it takes to bring the very dangerous “Green Fields” technology under their control. Mark Sullivan is the author of nine thrillers, including PRIVATE BERLIN, which he co-wrote with James Patterson. He was an Edgar Award finalist, winner of the W.H. Smith award for “Best New Talent,” and his debut novel, THE FALL LINE, was named New York Times Notable Book of the year, a rare honor for a debut. His next standalone novel, OUTLAW, launches in October 2013. He currently resides in Montana with his family. 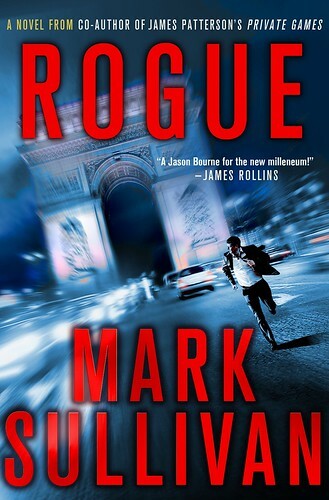 Courtesy of Minotaur Books, I have a copy of Rogue by Mark Sullivan for two (2) lucky winners! Contest is open to US and Canadian residents only. No PO Boxes, please. To enter, just fill out the form below. Contest ends September 6. I’ll draw names on September 7, and notify winners via email. Thomas Kilbride is a map-obsessed schizophrenic so affected that he rarely leaves the self-imposed bastion of his bedroom. But with a computer program called Whirl360.com, he travels the world while never so much as stepping out the door. He pores over and memorizes the streets of the world. He examines every address, as well as the people who are frozen in time on his computer screen. Then he sees something that anyone else might have stumbled upon—but has not—in a street view of downtown New York City: an image in a window. An image that looks like a woman being murdered. Ray is a sympathetic character who feels responsible for his brother now that his father has passed away. Thomas shows more signs of a higher functioning autistic than schizophrenic, but that’s the author’s prerogative. The story jumps around a bit between Ray’s point of view and a few other characters. Each are well developed and complex, especially the killer. This is the first book I’ve read of Barclay’s. The story dragged out a bit at times, with some unnecessary diversions from the main plot. But it was still a riveting thriller interesting characters and plenty of suspense. There were several fun twists that I didn’t see coming. With just as much drama as there is intrigue, this was a fascinating read that didn’t disappoint. Sixteen-year-old Noa has been a victim of the system ever since her parents died. Now living off the grid and trusting no one, she uses her computer-hacking skills to stay safely anonymous and alone. But when she wakes up on a table in an empty warehouse with an IV in her arm and no memory of how she got there, Noa starts to wish she had someone on her side. Enter Peter Gregory. A rich kid and the leader of a hacker alliance, Peter needs people with Noa’s talents on his team. Especially after a shady corporation called AMRF threatens his life in no uncertain terms. But what Noa and Peter don’t realize is that Noa holds the key to a terrible secret, and there are those who’d stop at nothing to silence her for good. Noa is a street-wise girl who was raised in various foster homes and juvenile hall. She’s self-sufficient and distrusting of others because of that hard life. When she wakes up in a strange place having been cut open with no memory of it, Noa’s experiences are truly terrifying and pulse-pounding. Meanwhile, Peter has some excitement of his own after he snoops through his father’s desk and attempts to investigate an organization called AMRF. Both are computer hackers, but Noa excels at anonymity where Peter seems to get caught. Don’t Turn Around is an exciting, fast-paced thriller with a bit of science fiction. This was a bit of Dean Koontz for young adults. Though, adults can certainly enjoy too. The teen angst is kept to a minimum. Instead, the story focuses on the mystery of AMRF and Noa and Peter’s search for answers while on the run from unknown pursuers. With plenty of twists and turns, there is never a dull moment in this fantastic page-turner. And there is plenty left open-ended that begs for a sequel. Detective Lucie Hennebelle hears from an old boyfriend who has suddenly gone blind after watching an old, violent film with a mysterious past. As Lucie investigates the film, she discovers terrifying subliminal images embedded in the film. Suddenly, people who have come in contact with the film are being systematically and brutally murdered. And Lucie is in a race against time to track down any loose ends that may lead to the killers and their motive. Meanwhile, Inspector Franck Sharko is investigating the murder of five men whose bodies resemble a similar string of murders in Egypt years before. This is a translated, international best seller from French author Franck Thilliez. The feel of the story was reminiscent of Lars Kepler’s recent novel The Hypnotist. A police procedural meets international thriller, the story is fast-paced and fascinating. The characters of Lucie and Sharko both have dark pasts and are jaded, but begin to find solace in each other. And of course, their investigations diverge quickly in the story, though the reason isn’t quite clear right away. Dark and dramatic, Syndrome E delves into bizarre neuroscience that is often gruesome and violent. When the story began, I immediately thought of the horror movie, The Ring. But this isn’t paranormal horror, and of course isn’t as scary. Though, there is always a looming sense of danger and suspense that lingers till the surprising climactic ending. This was an enjoyable change of pace from what I normally read. Fans of The Hypnotist and The Girl with the Dragon Tattoo should check out this new release.